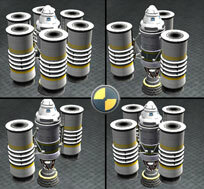 The TT-38K Radial Decoupler is a decoupler that allows for staging rockets horizontally and in parallel. The TT-38K adds a stage to the rocket and when activated will jettison the Decoupler as well as anything attached to it, much like the TR-18A. Visually, the decoupler's legs are left behind, but they add no mass or drag to parent part. In the past liquid fuel system modules could not be attached to a TT-38K, however you could attach TT-38K's to solid fuel system modules. An easy workaround used by many was simply attaching a RT-10 Solid Fuel Booster to the TT-38K and then stacking liquid fuel system modules below. Since version 0.13 however the stock liquid fuel systems have been radially attachable and either fuel engines below them, or through use of the FTX-2 External Fuel Duct fuel line, also introduced in this version. You will often find that if you have a long section of liquid fuel tanks or solid boosters that they can twist the joint and potentially break off or explode on your craft. For this reason it is wise to use the decoupler towards one end of the side pod and use EAS-4 Strut Connectors to keep the other end steady, preferable a pair to help reduce the twisting the side pod might have. You should also consider using the decoupler towards the top of the side pod, so that jettison force helps push that end away from the ship, effectively peeling the side pods away. Unlike a stack decoupler, a radial decoupler can be combined with symmetry to an interesting effect. Using the symmetry feature found in the VAB, one can attach 2-8 symmetrical pieces onto their main fuel engine, to allow for more balance in precision in placing your initial booster stages. See example. Pieces however, whose collision mesh collide with one another will not stay onto their respective decoupler; this means you'll have to use fewer decouplers per stage, and more stages if you want more pieces. This page was last edited on 7 March 2017, at 15:17.